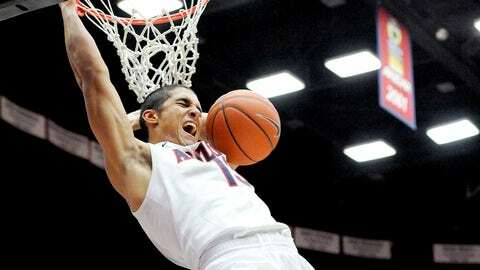 Nick Johnson led Arizona with 16.1 points and 2.77 assists while also earning a spot on the Pac-12 All-Defensive Team. TUCSON, Ariz. — Aaron Gordon found out mid-morning on Monday that he had been named Pac-12 Conference freshman of the year. "I woke up to a bunch of congratulatory texts, and that really warmed my spirit," Gordon said. This from a guy who just a couple of months ago was named USA Basketball’s male athlete of the year. It’s been that kind of year for Gordon and Arizona, a team that made off with three of the Pac-12’s five individual awards for the 2013-14 season on Monday. Sean Miller was named coach of the year for the second time, and junior Nick Johnson was named player of the year in addition to being named to the all-conference team and all-defensive team. Gordon also was a first-team All-Pac-12 selection. Consider that not once this conference season did a UA player win a player of the week honor. It goes to show you that teams win championships and eventually get the recognition they deserve. It was Miller’s message when asked about the awards. "We like to preach that when you have a great season or you win a championship and (when) you have a special-start-to-finish that we’ve had to this point … you always say that the individual accolades will follow," he said. "It’s really nice to see that happen." In addition to the trio of Wildcats, ASU senior center Jordan Bachynski was named defensive player of the year, and Stanford guard Anthony Brown was named most improved. There are likely to be plenty of more individual honors to follow for the Wildcats when the time comes — but first there’s more basketball to be played at the Pac-12 tournament in Las Vegas. Arizona, 28-3 and No. 4 in this week’s AP poll, will play at noon (PT) Thursday against the winner of Wednesday’s game between Utah and Washington. How significant was the Pac-12 trifecta of Miller, Johnson and Gordon? Well, it’s never been done in school history, and Arizona has had plenty of players and a coach (Lute Olson) to qualify. "It’s quite an honor if you look at the history of our conference and even here at Arizona the players who have won the award," Miller said. "It’s a heck of an award. It’s great company. "Nick’s meaning to our team’s success is … I can’t put a value on it because it not only happened on the court but off the court. He’s a natural leader. He’s had a fantastic season." Johnson, who is a finalist for the Wooden Award as the nation’s top player, is Arizona’s eighth Pac-12 player of the year, joining Sean Elliott (twice), Derrick Williams, Damon Stoudamire, Jason Terry, Mike Bibby and Chris Mills. "It’s a great honor to be in that category … I couldn’t ask for anything more," said Johnson, who leads the Wildcats in scoring (16.1) and is second in assists (2.8) and steals (0.8). But it wasn’t the award he was shooting for at the beginning of the season. "My goal was to get defensive player of the year," Johnson said. "I didn’t achieve that. I got the other one … (but) I am thankful for being part of the defensive team." Backcourt mate T.J. McConnell joined Johnson on the all-defensive team, but Johnson suggested that there could have been more. "I know you can’t put all four or five of us on it," he said. Miller was a bit taken aback when he realized Gordon wasn’t on the list. "You could have put four guys on that team," Miller said. "For T.J. and Nick to win that award is very gratifying. Aaron and Kaleb (Tarczewski) could have been part of that, but you can’t put everybody on." As for Miller’s award, Johnson said, "he deserves it. These three awards are really team awards, (but) without him I could not have won it." Gordon is Arizona’s seventh player to be named freshman of the year. "There may be some freshmen in this country who stand out more, but what Aaron means to our program in terms of humility, unselfishness and him being such an easy guy to coach and being a great teammate (is immeasurable)," Miller said, ‘It’s one of the things we’ve had such a good season." Joining Johnson and Gordon on the 10-player All-Pac-12 first team were guards Jordan Adams and Kyle Anderson of UCLA, Jahii Carson of Arizona State, Justin Cobbs of California, Chasson Randle of Stanford and Delon Wright of Utah and forwards Dwight Powell of Stanford and Josh Scott of Colorado. Arizona’s McConnell was a second-team All-Pac-12 selection, and forward Rondae Hollis-Jefferson was named to the All-Freshmen Team alongside Gordon.